The BLS Job Openings and Labor Turnover Survey (JOLTS) can be used as a predictor of future jobs growth, and the predictive elements show that the year-over-year growth rate of unadjusted private non-farm job openings again were insignificantly changed from last month. It comes as no surprise that JOLTS is continuing to show little year-over-year job openings growth. Historically, this indicates weaker employment growth. Both employment and JOLTS job openings year-over-year growth have been slowing for the past year – and the short term trend is flat. This aligns with Econintersect‘s Employment Index and the Conference Boards Employment Index – but both indices are forecasting moderate employment gains similar to the last five months weaker employment growth. 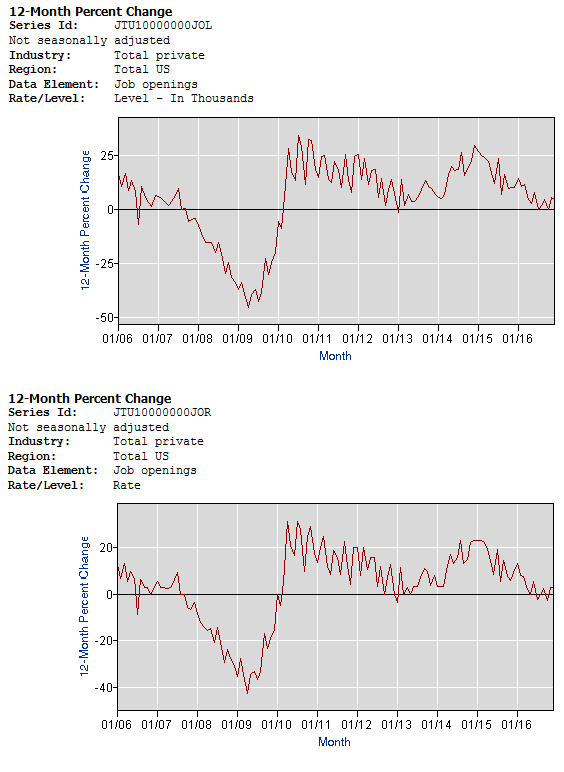 The relevance of JOLTS to future employment is obvious from the graphic below which shows JOLTS Job Openings leading or coincident to private non-farm employment. JOLTS job openings are a good predictor of jobs growth turning points – and have similar trend lines.